Some people do not place routine dental visits on their list of priorities. If this describes you, it is time to make some changes. There can be many complications when you make excuses for avoiding the dentist. 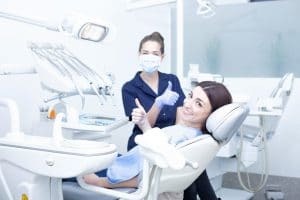 What Will You Gain From A Routine Dental Visit? You are not experiencing any problems with your teeth or gums. You may believe this means your oral health is excellent, and a dental visit would be a waste of time. This is not a valid excuse. Even if you show no signs of oral health problems, it does not mean they do not exist. One of the most important benefits of a dental visit is a thorough examination. When your dentist performs an exam, dental problems may be detected that you have not yet noticed. The earliest stage of gum disease, small cavities, and other issues may be found when they are much easier to treat. Professional cleaning is a second benefit. Daily home dental care is not nearly as effective as having your teeth cleaned at the dentist’s office. When you want your teeth to be completely free of plaque, tartar, and bacteria, it can only be accomplished by your dentist. When you make an appointment, your dentist will advise you on how often you need routine visits. For most people, visits should be scheduled twice each year. Your dentist may recommend more frequent visits if you have oral health issues or certain types of dental work. Mark your dental appointments on your calendar at home. Keep a list of questions you want to ask your dentist. Make routine visits a priority, the same as any type of health care service. No matter how busy you are, you can find time to keep your appointments. It is a way to maintain dental health.